Welcome and enter the magical world of Greek mythology. 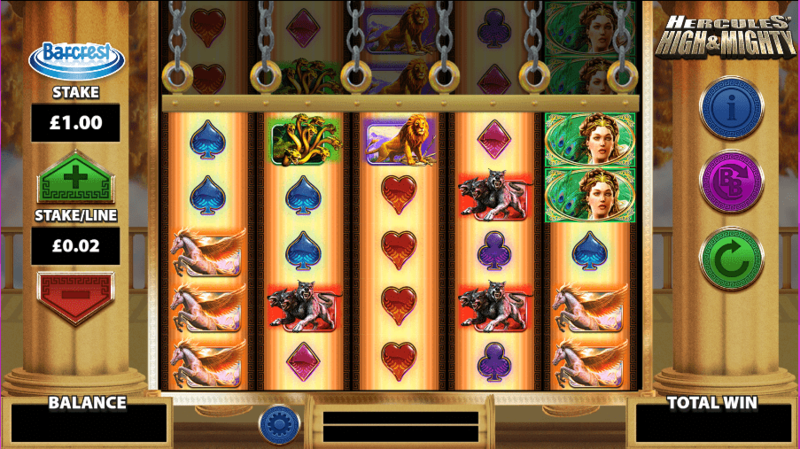 With mindboggling strength, Hercules, the son of Zeus, uses his bravery to labour and win in this fun and challenging slots game. Atmospheric and mystical, ‘Hercules High and Mighty’ displays two immense columns of marble on which the reels are dropped ready for the game to begin. The Barcrest games team have produced a fantasy land in which to immerse yourself and the game is smooth to use and all the more enjoyable for it. Very simple to play due to the command buttons down the right-hand side of the screen. Founded in 1968 and initially a design and manufacturing team of analogue fruit machines, Barcrest Games now produce the best of the best when it comes to online slots. Innovative and enjoyable, the team have released a veritable treasure trove of casino slots for players everywhere. In 2011 Barcrest was acquired by Scientific Games and they go from strength to strength in producing fresh and exciting slots online that any gamer can enjoy. If you love to play ‘Hercules High and Mighty’ then these other game choices could float your boat, ‘Wild Knights Kings Ransom’, ‘Moon Shadow’, Legend Of Bigfoot’ and ‘Jewel In The Crown’. You can play these slot games and enjoy their exceptional graphics and the excitement with a large possibility of winning. This is only one of several best UK slots! There are a number of good possibilities to score winning combos across reels because the game features 5 reels and 50 paylines initially. You can choose your wager before spinning the reels via the arrows. With ‘Hercules High & Mighty’, there is the possibility of unlocking bigger rewards by hitting the big bet option, five spins for a fixed stake and you can play for £20, £30 or £50. ‘Hercules High & Mighty’ has some awesome characters which you will recognise from Greek mythology, including Pegasus, Cerberus, Hera, Zeus, Hydra, and Nemean. The pack of cards symbols of diamonds, hearts, spades and clubs in their combinations are worth up to 10 credits. 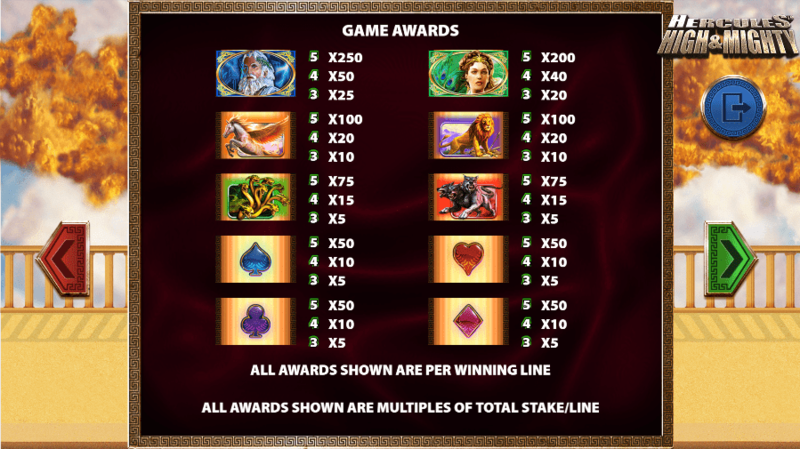 This game shows innovation too as there are chances to multiply winnings, keep your eyes peeled for Hercules (the wild card) appearing on the reels. He will be able to replace other symbols and give more chances to win cash prizes. The Golden Coin symbol acts as a scatter and three or more will offer you the free spin feature, this comes complete with lightning strikes and music! When playing big bets, free spins can be triggered a number of times to offer huge winning potential. These labours of Hercules don’t feel like hard work to us, just pure joy! Full of surprises, ‘Hercules High and Mighty’ thrills with anticipation, as the chances of winning are so high. You can making these chances even higher by using the big bet feature as often as you can. So why not immerse yourself in this mythology adventure and be your very own Greek god or goddess of online slots! Or why not play Ninja Ways?